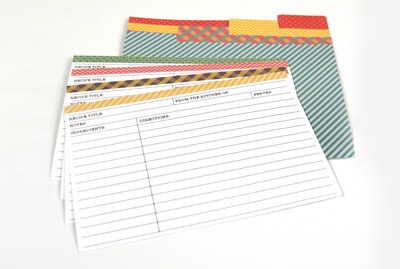 Free, printable recipe cards and patterned dividers are available from Love Vs. Design. These might be useful for sharing recipes with friends or whipping up a nifty wedding shower gift in a recipe box. wow, thats really cute, mine is just written on plain index cards. super cute indeed! i like how they can be organised in a box! I totally clicked the wrong option for my name.. That was me from aboves comment... Sorry about that..
Those dividers are so pretty! These look hip! Thanks for sharing! Pinning it too! Thank you for sharing. Thanks for posting these! I was so inspired, I created some free recipe card printables of my own and posted on my blog today!